I don't usually read horror novels, not the biggest fan as I find a lot of them cheesy. But this one wasn't bad. If you're a fan of Stephen King novels then you probably want to check this one out, as Joe Hill is Stephen King's son. Billed as a supernatural thriller, I thought about a quarter of the way through that I had this book's number and it was really a Manchurian Candidate-type story. I have a feeling my mind convinced me of that so that it wouldn't allow me to get too creeped out reading this in the house by myself at night! It really is a supernatural thriller and Hill knows how to bring on the creeps. If I'd allowed it I could have been totally creeped out. At first Jude doesn't seem very likeable, but I think that's the point. He is an ageing death-metal rocker after-all! I imagined him to be a Marilyn Manson/Ozzy Osbourne-type in my head. But as the story goes on and you learn more about Jude and his life you start to feel for him a bit, especially when the ghost really starts going to town on them! Jude and his girlfriend end up going on the run from this ghost, but really, there is no where to run. They're gonna have to face it sooner or later. I enjoyed this because it was easy to read and fairly fast-paced. I found myself really starting to like Jude and his chicky and wanting them to outsmart this ghost and Take.It.Down! The only thing I really didn't like was that I thought it should have ended a couple of chapters before it did, but I suppose when it does end you realise it was heading that way the whole time. In a way the ghost makes Judas confront his own demons and become a better person. And I liked that his dogs names were Angus and Bon (you know, AC/DC). 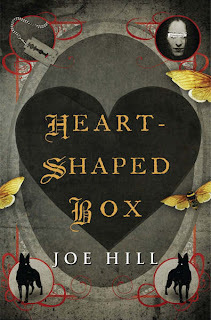 A Thumbs Up from me on Heart-Shaped Box.